What can we learn from the great leaders of the past? In this unique and engaging volume, James Adonis, one of Australia's best - known leadership educators, shows how we can apply the lessons of history to the challenges of the present. 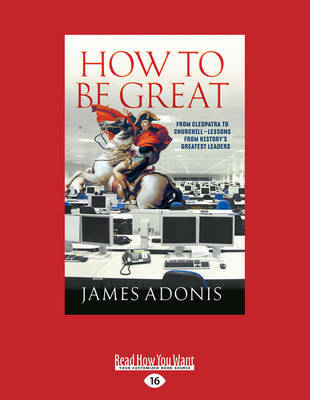 Drawing on examples from Walt Disney to Joan of Arc, Adonis explores the many different aspects of good leadership, illustrating how history's most successful leaders have used particular leadership styles to their advantage, and explaining how we can use those same techniques in the modern workplace. The key to good leadership? Adaptability. Certain situations may require Benjamin Franklin's pragmatism, Dorothea Dix's dynamism, or something altogether different - the most important lesson is that the very best leaders are able to adjust their style to suit any given situation. Covering more than fifty historical leaders, ranging from Julius Caesar and Eleanor Roosevelt to less familiar figures such as suffragette Emmeline Pankhurst, US President James Madison and environmental activist Wangari Maathai, How To Be Great is an entertaining and insightful leadership book with a difference.